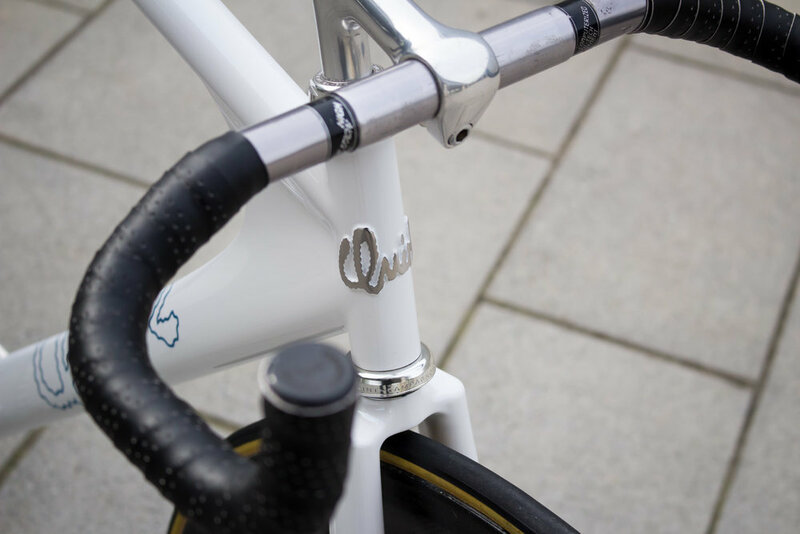 Jack's Lo-Pro Pursuit — Quirk Cycles | Custom Steel Bicycles Handmade in London by Framebuilder Rob Quirk. Way back when Quirk Cycles was just starting out, Jack came to us with a renovation project. He had a vintage lo-pro that he wanted a wishbone adding to. We did the work and Jack left with the promise that one day he would order a full custom lo-pro. He was't kidding. 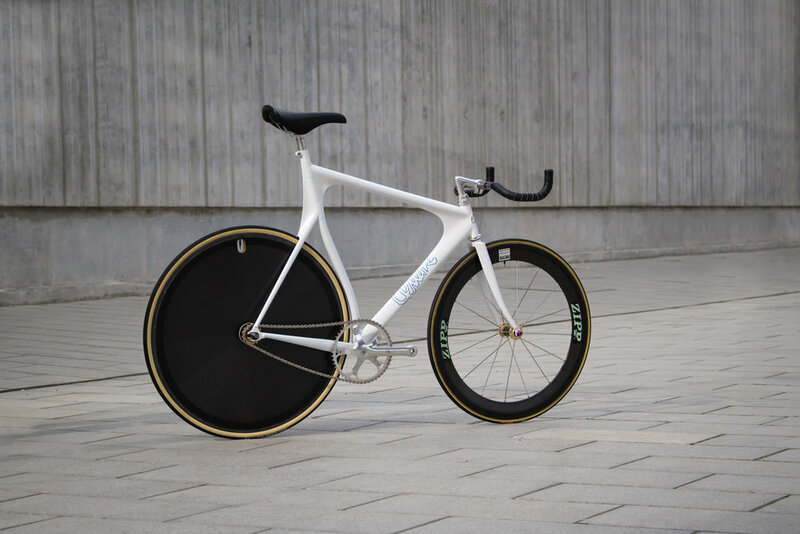 Jack did return and with it his vision for a modern custom steel lo-pro, a homage to the heady days of hour records and early nineties track cycling, before new materials and UCI bans put to bed aerofins, 650c front wheels and impossible positions. We started this build at the seat-tube which is curved to accommodate the rear wheel allowing it to be pulled in as tight as possible to improve aerodynamics but also get a the super-short wheelbase we wanted for quicker handling. 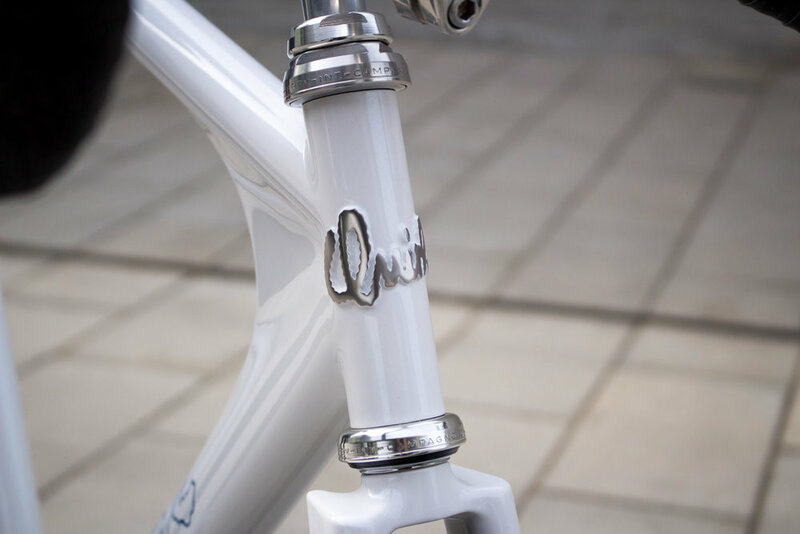 Usually we would start with the front triangle of a frame but in order to accomplish the tight clearances necessary we built the rear triangle before the front. This meant we could focus just on getting that wheel to sit just right. 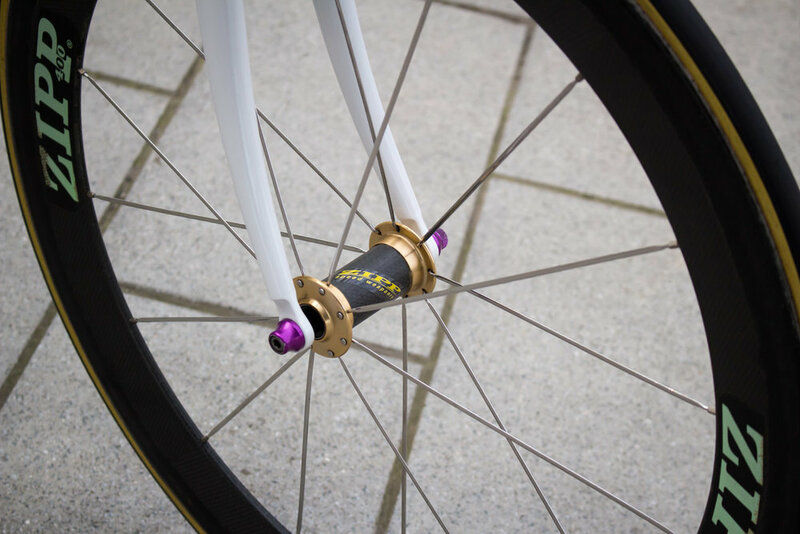 Jack has a special penchant for wishbone stays and this build is no different but we were keen to make one that was a little more unique than the usual thin diameter tubing. Using a 1" tube for the body we set about blending the seatstays into this to form a more seamless shape. This was one of the hardest parts of the build as the central tube floats and does not register on any other part of the frame. Supporting this piece for welding and acheiveing alignment was very difficult as it could move if not held well enough. 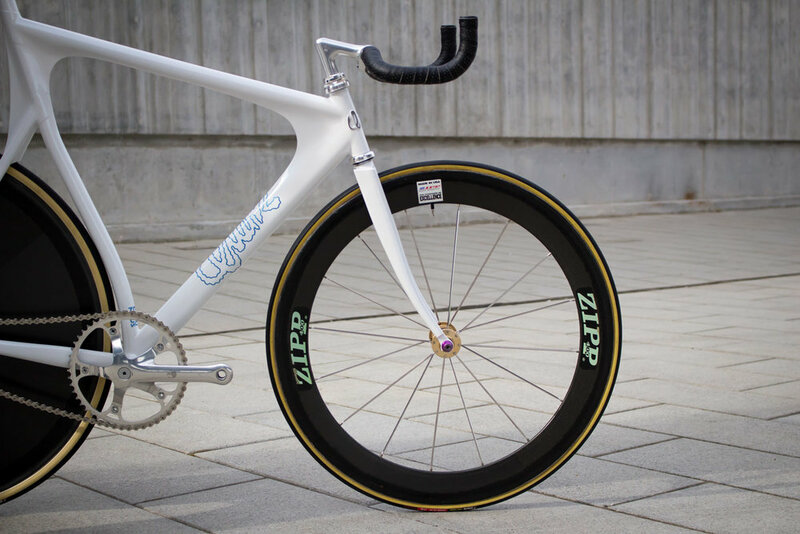 The end result was worth it and coupled with the aerofin on top, the lines and contours of the surface form to make an wonderful transition to the rear wheel. For the front triangle we used a mix of Columbus megatubes to compliment the sculptural forms of the fins. The fins themselves were constructed from thin steel plate which were then shaped in the corners with flex-epoxy to get the seamless transitions you can see. This was one of the most time consuming processes and was taken care of by Cole Coatings Workshop. Cole also handled a beautifully executed paint job of pearlescent white and shimmering blue. 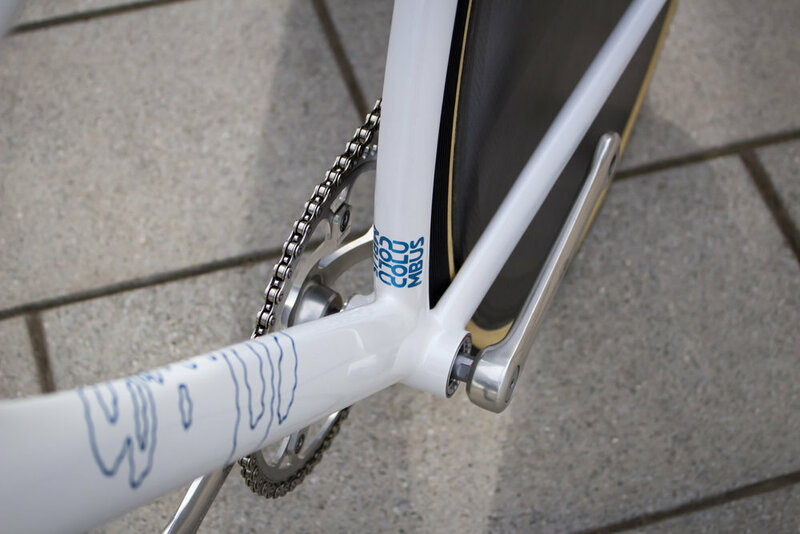 The blue of the logo is our nod to Cinelli Lasers and Cannondale Track builds. Possibly two of the most coveted and iconic builds in track culture. Of course the build had to be finished with hand-built forks partnered using a Samson track crown and Columbus MAX blades that were custom curved in house. Again simplicity rules here and the gentle curve of the blades reflect those of the frame. This was one of the longest builds to complete that we’ve ever done as so much work has gone into its design, construction and execution. Not our usual type of build and not sure if we’d make another but certainly glad we made this one. A truly awesome project that was great to work on. Oh, and before you ask, yes it’s been built to be ridden, Jack has the honour of having the biggest bar drop our fitter has ever fitted, a meagre 22cm. He’s as curvy as his bike!